Home » Blogs » Charles Gaba's blog » With the exception of Jed Graham, IBD can bite me. As an aside, their math is a bit off here: The number claimed by HHS was 7.3 million, and the actual total turns out to be 6.98 million (believe it or not, double-counting all 393K adds up to 7.37 million...they actually rounded down to 7.3 in their August number, ironically enough). So, the difference turned out to be (7.3 / 6.98 = 4.6%, not 6%...but that's a quibble). Naturally, the administration is claiming that this was done by mistake, via not thinking to break out the policy payment data being sent to them from the insurance company, while critics and many healthcare reporters are claiming "bullsh*t" on that defense. I haven't made my own mind up yet, but even I read them the riot act yesterday morning, and was quoted extensively by Alex Wayne of Bloomberg News (who also broke the story). Before I go on, I need to remind readers that I said at the time that the 7.3M August figure was released that I was surprised that it was that high because I was expecting it to actually be...wait for it...right around 7.0 million even as of mid-August. In addition, I was the one--in conjunction with IBD reporter Jed Graham--who posted a piece on November 6th specifically stating that QHP enrollment as of October had likely dropped below the 7 million mark, and may even have been as low as 6.8 million (it turned out to be slightly lower yet, at 6.7 million as of 10/15). It was Graham--who used my data in the first place--and I who mutually agreed that the October number had likely dropped down to 7M or below. He used my data, he and I discussed our interpretations of it extensively on Twitter, and I posted my own piece giving out the seemingly bad news: 6.8 - 7.0 million seemed to be the correct number as of October. In other words, not only was I correct regarding both dates, I didn't try to hide the lower numbers--in fact, I went a bit overboard, especially the second time, Tweeting out my findings to every healthcare reporter I've made contact with over the past year. In July, we were the only publication to pick up a finding buried in an Inspector General reportthat the administration's enrollment numbers were unreliable because "it cannot effectively monitor the current enrollment status of applicants, such as ... termination of plans." At the time, we calculated paid enrollment was more like 7.2 million or less, not 8 million as everyone continued to insist. Well, first of all, no one I know of was ever claiming that all 8 million of the 4/19/14 enrollees had paid up. I got into a well-established and documented tussle with the likes of Avik Roy, Chris Conover and other conservative pundits about what the payment rate was, and while I proved time and time again that it was much higher than the absurd 67% claimed by the GOP House Energy & Commerce Committee, I never claimed it was 8 million. At first I thought it was as high as 93%, but it then became clear that it was lower than that. I went with a flat 90% for most of the summer, but in the fall ratcheted it back a bit further to 88%, which is what seems to be the case. Changing your assumptions based on new evidence is what an analyst is supposed to do. Charles Gaba, an ObamaCare booster who runs a site called ACASignups.net, which has been widely cited as a credible independent source of enrollment numbers, at one point blasted IBD for "mangling" his data. He said paid ObamaCare enrollment was upward of 8 million by the summer. OK, let's stop there for a moment. There are two problems with IBD's entire premise, as I noted in the very "mangling my data" entry that they refer to. The first is that enrollments didn't stop on April 19th. During the off season, upwards of 9,000 - 10,000 people per day were still enrolling (while another similar, if slightly higher number were dropping their policies). 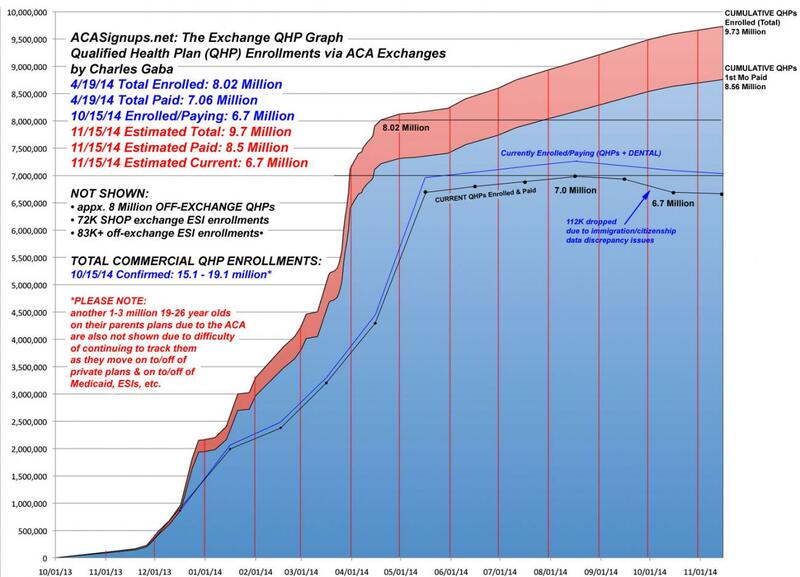 By the time August 15th rolled around, roughly another million people had quietly enrolled...of which a good 75% or so had also paid their first policy (the payment rate was far lower for those who enrolled between 7/16/14 - 8/15/14, of course, since their policies wouldn't even start until September). The point is, that I was always very open about the fact that only about 7.2 million (notched back to 7.1 million later) of the original 8 million had paid their first premium, plus another 750K or so of those who enrolled in May, June, July & early August. That's around 7.9 million who paid their first month's premium. In other words, yes, close to 8 million people had indeed paid their first month's premium as of mid-August. The second problem is that IBD was acting as though I'm claiming that every person who paid their first premium has continued to pay every month since then, which clearly never was the case, and which I've never claimed at all. That's the "attrition" factor, and I've struggled mightily to figure out how high that was...which is where my "7.0 million as of August" statement came from which I clearly stated at the time of the 7.3 million claim. In other words, yes, IBD's John Merline did indeed "mangle" my data, although he doesn't appear to have meant any harm by it; he was just confusing the fact that the payments are an ever-changing, rolling number...new people may have enrolled on April 16th, had their policy start on May 1st, had their first payment go through on, say, May 5th, and then gotten a new job with ESI on July 24th or something, at which point they drop their policy. They were counted as part of that original 8 million figure, paid for 3 months of premiums, but then dropped their policy in August. Another person might enroll via a life change on May 24th, paid for 4 months and dropped their policy in October. The numbers are going to constantly ebb & flow, and are a pain to keep track of at any given time. Gaba's own spreadsheets now show that paid enrollment — net of attrition — was 6.9 million in July. That is 300,000 less than IBD had calculated. Actually, that was exactly what my spreadsheets showed, very publicly, in July and August as well. It wasn't until HHS issued the 7.3 million number that I openly said, "Wow, I guess I was wrong!" and modified my projection accordingly...based on what I thought was new, correct data. It turns out that I was right in the first place. I haven't "changed" my spreadsheets to "cover up" being wrong; I changed them back to what I had said at the time. And they suggest that ObamaCare paid enrollment never got anywhere near 8 million. About 7.1 million paid their first premium out of the first 8.02 million. Another 264K or so paid their 1st out of the next 300K, while X million of the first 7.1 million paid their 2nd premium. ...and so on, and so on. In other words, yes, well over 8 million people have indeed paid their first month's premium. That is not the same as claiming that 8 million have continued to do so each and every month, as I've made very f*cking obvious in The Graph for quite some time now. See that red section? That's the number who enrolled, whether they ever paid even a single premium or not. See that blue section? That's the number who paid for at least their first month's premium, which is indeed a good 8.5 million or higher to date. See that black dotted line? That's the number who are currently enrolled and paying as of that point in time, and that's the only part which has changed significantly since before the "DentalGate" (or whatever) announcement from yesterday. Christ, I even include the original line (which includes the dental plans) just so everyone can see that I'm not trying to "cover up" anything for the HHS Dept. Reporters covering the latest ObamaCare deception say they can't understand why the White House would do such a thing. Gaba says he's "upset" and feels as though the White House has been "jerking me around." I'm pissed as hell at HHS because they either screwed up royally or they deliberately misled me and everyone else...and I've been bitching at them for a solid year now about being more transparant and open with their data. But for IBD to use "sarcastic air quotes" to imply that I was in on a cover-up or whatever?? Jed Graham is a good reporter, but his employers can go to hell.